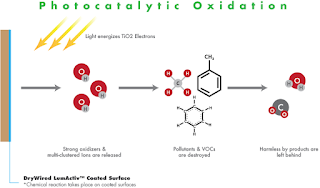 PCO (photocatalytic oxidation) is a technology that breaks down mould, VOCs as well as some pathogens. My interest in these air purifiers comes from first-hand accounts of this helping people with mould and VOCs and from the studies showing the eradication of mould and mycotoxins. This is a technology that is extremely promising for those sensitive to mould and it's important that we test this out as much as we can. I'm really urging the mould community to gather more data on this by trying some of these machines. I am really excited about this technology as something that can safely break down mycotoxins and odours. Some people may be interested in its effects on breaking down viruses and bacteria as well. 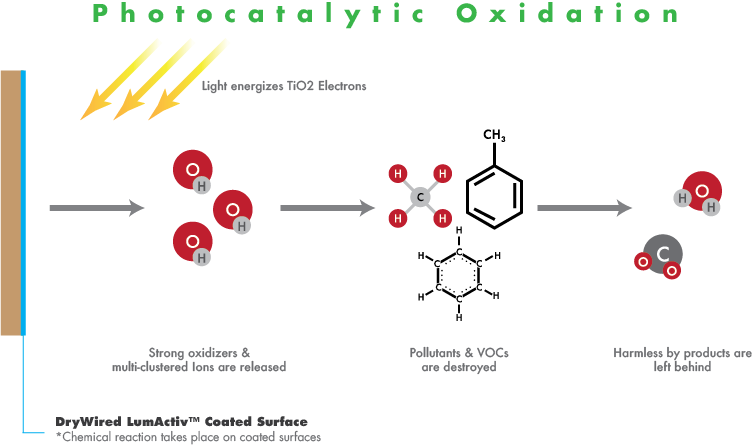 A very brief explanation of PCO is that UV light hits a catalyst, usually titanium dioxide, creating hydroxyl radicals (OH). These OH molecules bind with and break apart pollutants into harmless molecules. My recommendation is based on the most affordable and effective product that I have found. Buying your products through affiliate links helps support me and this blog. I use the Vornado air purifier. The Vornado PCO300 ($260) and PCO500 ($470) are air purifiers with a great value. 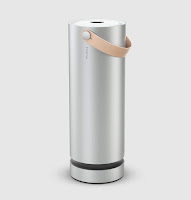 It is a PCO air purifier plus it has true HEPA and activated carbon. Most PCO units are much pricier or don’t include all three air purification methods. True HEPA and activated carbon capture dust, pollen, pet dander, smoke, bacteria, mould spores, dust mites and odours including VOCs. PCO and carbon are the main technologies used to reduce odours and VOCs. (Ozone can as well, but it is very risky, I have a post all about ozone). PCO actually breaks down molecules including moulds and mycotoxins. I like that it has all three main air purification methods. What I don't like about it is that the unit itself offgasses, though not everyone thinks so. After two weeks I found it to be good. The difference between the two sizes is that the 500 has a lower low speed and a higher high speed. The 500 has 2x the HEPA and activated carbon of the 300. They both have the same PCO technology - so if you want to increase the effectiveness of the OH molecules in a large space you would want two of the 300 instead of one 500. The 500 moves 184 CFM and is advertised for 265 sq ft - around 5 air exchanges per hour. Some other PCO units are more or less the same unit re-branded: Continental Fan CX1000, Catalytic Pure Air, Field Control Trio / Sun Pure SP-20C. They seem to use a very similar PCO catalyst style to the Vornado with a titanium dioxide plated metal screen. Another brand that is very affordable that also incorporates HEPA, carbon and PCO is GermGaurdian. I have heard of people using it in trailers and being happy with. At $89 it's a steal. And it has 5.5 ACH in 171 sq ft. The Molekule - If I had to go back and pick one right now, I would choose Molekule. Though I still might want another unit with HEPA, and if I was dealing with off-gassing, I would add in one of these with lots of carbon. This requires $100 a year in replacement parts. I will review a few other brands that I ruled out for myself: Air Oasis and HiTech, as well as Airocide. The Air Oasis 3000G3 model ($500) is rated for 3,000 sq ft and only moves 11 CFM of air. 3,000 sq ft at 11 CFM is 0.02 air exchanges an hour. That is very little air movement. Air Oasis does more than just PCO it also, as the company states, “creates ionized hydro peroxides” (AKA it's an ionizer) which puts out ozone and does NOT meet the California regulations on a safe level of ozone (CARB). You can have one made without the ozone production component but that seems to be a key component in its air cleaning abilities. It has a 3-year warranty and the replacement parts are $80 every 2 years. I know this brand because it is being promoted by top doctors. I was surprised when I dug into it to see how ineffective it would be at moving air, and that it gives off unsafe levels of ozone (as determined by CARB). There is more of a discussion of this brand and their technology in the comments, as this machine claims to be doing something different than just a PCO or just an ozone machine. HiTech Air Solutions, a brand known among extreme mould avoiders, makes Air Reactors that claim to be PCO machines. To start, the 101 model ($2000) is very expensive relative to the other PCO machines. From looking at the inside of the machine they use basic components that total under $150 for all visible parts: four foam/coarse dust filters, two UVC lights, two computer fans, and a 4U 19" rack case. The claim here is that some of these filters are photocatalysts that produce OH molecules - that there is something invisible called "Technosite®" (no evidence of this trademark with USPTO) impregnated onto the filters. They may be using something similar to PALCCOAT (confirmed not partnering with this brand) which is a clear titanium dioxide catalyst (FYI $13 per square meter). I have found no evidence of a patent held by HiTech or Ray Robison, owner, on anything in the machine. (I have also seen two other odd claims from sales reps of the company - one, that the filters are coated with Sporax and that both the filters and the bulbs are also coated with something proprietary - both things that I would want to know are safe to use with UVC light). HiTech claims to be doing something different than the others. They claim their OH molecules (which are produced by the PCO process) last much longer in the air than the other air purifiers' OH molecules (~6 weeks instead of ~15 seconds) based on "a study by Texas Tech", though this study cannot be produced by the company. Dozens of phone calls were made to track down the existence of this study and nothing turned up. Even more, the University claims it does not conduct studies give the results on the phone and then withhold the report for large sums of money (as the reps claim). I have not found any evidence that this produces a totally different kind of OH molecule. Just ask a chemist how you can have a stable but also reactive OH molecule. I would like the company to disclose what they are using in this machine so we can know if it is safe and effective, or, provide the studies that show which molecules and byproducts this machine produces. The burning smell is worrisome to me. I have seen photos of users machines showing the filters having being burned through by the UV light. That will produce offgassing. The accounts I have seen of bad reactions are also worrisome. HiTech claims it produces 99.9% pure air. I have seen no studies to back up this very broad claim. What is the level of contamination in the air to start, and what is "pure air"? Also note, PCO technology does not filter particulate pollutants (EPA). I have contacted a technical rep, sales rep and the owner for these studies - they responded but were not able to provide them. Others have contacted them as well for this information. The HiTech 101 is 142 CFM and claims it can be used in 1600 sq ft which is only 0.7 air exchanges per hour. Their bigger units are ~$5000 and ~$6000 dollars. The HiTech sales reps make 25% commission off each unit and they usually recommend multiple units for houses. The commission for the three sizes is roughly: $500, $1000 and $1500. The cost of the replacement parts are $140, $190 and $295 per year, for the three different sized units. HiTech has not submitted their Air Reactors to CARB to confirm they give off a safe level of ozone. However, the bulbs they are using are USHIO brand UV bulbs with a 2G11 / PL-L base which do not give off ozone. They use another brand as well, LSE Lighting UV bulbs, with the same base. From what I can tell this bulb would not be any different from the USHIO brand. The FDA approvals I have found are one for a PCO machine involving titanium dioxide (it proved to destroy some bacteria, viruses and mould) for specific commercial uses. The Airocide and Odorox also have FDA approval as type 2 medical devices for use in hospitals. These all use titanium dioxide and UV; The FDA approval cannot be stretched to make safety or health claims on any device that deviates from this technology or has unknown additional technologies. HiTech claims to be FDA approved, I can find no evidence of that. Anyone can search for FDA approvals here. HiTech did respond to this article, some of the statements have changed from what I have records of, and the updates are in the comments. They have since put out some "study result photos" with no evidence of a study. Another popular PCO machine that has been around for a while is Airocide (CFM 14 “Cleans any size room” which I suppose is technically true, but is not going to get you 5-10 air exchanges in most rooms, $600.) This doesn’t move a lot of air, but I like that the website has studies confirming that it doesn’t give off ozone, and a short study on breaking down mycotoxins. It looks cool which is a major plus. The claims about removing dust, dust mites and allergens are not all that accurate. PCO machines do not filter particulate pollutants (EPA). It has a 5-year warranty and 60-day money back guarantee which I like. The main drawback here is how little air it moves. 100 a year in replacement parts. I have heard of people having bad reactions to HiTech. I have heard only one bad reaction to Airocide, and a couple bad reactions to AirOasis. I do not know what accounts for these bad reactions. It does not appear that there is an ozone issue (apart from AirOasis). I don't have enough data on all these machines to know if bad reactions are more prevalent with any particular brand. HiTech reps speculate to buyers that the bad reactions may be helpful (some kind of detox or herx) which is ethically unsound in my opinion. With no data to suggest this is detox, we should take a precautionary approach. I would love to hear from more people who have tried these other brands. Let me know if you have had good results or a bad reaction to a PCO machine (other than to the plastic or glue of the unit). Since writing I have heard of some bad reactions to Molekule with about 50% of the people buying it being happy with it, and the other half not, and one bad reaction to Germ Guardian. It is possible that PCO is creating harmful byproducts in high VOC buildings. For high VOCs I would focus on filter that has a lot of carbon. My interest here is in a house with extremely low VOC levels and already extremely low levels of mould. And the hope here is to keep the air as mould free as possible. According to Airocide, the UV bulbs themselves emit a bit of a burning smell at first. They burn theirs in for two days, but sensitive people can smell it for up to a week. The Vornado PCO had a very slight burnt smell at first which seemed like the smell of carbon. HiTech states that the burning smell is mould/mycotoxins breaking down. I see no evidence for this claim. Airocide made a statement that mould does not produce a smell when broken down by OH molecules. A HiTech user also stated that the UV lights have burnt right through the "reactor pads". This is consistent with a theory that the UVC lights are burning the "reactor pads" and causing a smell. This post is not sponsored. As an Amazon Associate I earn from qualifying purchases through the Amazon links. This post was written with the technical assistance of an engineer, though the opinions and conclusions are my own. This post was written in June 2017, was updated in 2019. I do my best to keep all my posts updated if there is new information. I’m a fan of your writings. I’ve looked into air purification some too. Here are a few thoughts for your Reader’s consideration. 1. Vornado - I worry that many of the PCO oxidants the machine puts out are going to be drawn back into the unit and neutralized by the carbon. For this reason, I never run my IQ Air purifier with carbon along with my Air Oasis that uses PCO technology just for this reason. Air mixing is vital regardless of what air purifier you're using. 2. Air Oasis - 11 cfm - Mold remediation expert Greg Weatherman has a video with a 2,000+ cfm blower showing virtually no air movement a couple of feet from the machine! I'm guessing the folks at Air Oasis selected the fan sized based upon a calculated exposure time to the UV lamp - see my article on the UV Light Tube I built. 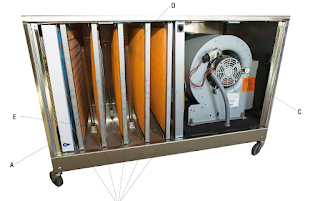 Air exchanges and cfm are irrelevant when it comes to selecting a small PCO device. Of course, there are whole house PCO units and then it’s important to select a unit based upon the cfm of the furnace blower. It's the number, quality, and type of oxidants produced that matter. Having said this, I do question the actual area these units can treat. I guess it depends on the level of contamination. 3. Ozone is a powerful oxidant. People apparently run ozone generators in enclosed spaces. I've written about how this can lead to undesired by-products in my article on autos and mold. The Air Oasis with the default lamp definitely puts out ozone. If you stick your nose right in front of the output, you'll cough. For this reason along with the importance of air mixing, I always run my Air Oasis with a ceiling fan on along with moving the unit about the house. For your readers that are really chemically sensitive, I believe you can ask for a lamp that doesn’t produce any ozone. 4. Titanium dioxide is the bare minimum for a good PCO machine. Air Oasis uses a mix of metals they believe work even better as I wrote about in my Air Oasis article. However, anyone can "talk a good game". The key point is that the reason some CIRS doctors are recommending them is because a preliminary study of 48 homes showed they made moldy homes livable again along with findings as in the video. Personally, I fine that there is a big difference in the air quality after running the Air Oasis in the main living area of our house overnight. I love having it because I can clean up the air after having guests that invariably track in toxins. The Air Oasis article is in the Members section. You'll need to create a free account and login. 1. The air moves through the Vornado first through the HEPA/carbon and then through the PCO aspect. So the OH molecules are flowing out, away from the HEPA/carbon. They would not move back against the air flow. They also only last a few seconds so all the action is on the catalyst not really about moving them through the air. 2. If the unit can't move much air through it it just can't be effective - it just won't reach the air in the room. If the air needed more time on the catalyst then you would need many Air Oasis units per room. 3. The Air Oasis emits ozone because it's also an ionizer. This level if higher than what California Air Resource Board finds is safe for healthy people. Those of us who are sick or sensitive should certainly follow these guidelines. The machines cannot be sold in California. Ozone has a long half life so I would not feel comfortable running it in one room in the day and another at night. 4. It's difficult to compare Air Oasis to the others because it is an ionizer and creates ozone. This will have some beneficial effects but the long term effects on people's lungs could be serious. Titanium dioxide is the industry standard - it's what NASA uses and the FDA approved machines are using titanium dioxide. So I do not know the effectiveness of using other metals. There would have to be a study comparing different technologies that does not also add ozone or an ionizer to the picture. I don’t want to get into this too deeply but here is my understanding. 1. PCO technology does produce hydroxyl radicals (OH) along with hydro peroxides (HO2) and hydrogen peroxide (H2O2). The peroxides can linger quite a while in the air. H2O2 lasts about 24 hours in the air – until it reacts with a toxin. 2. If we were simply relying on the fans of any of these units to move particles about, the air would never get thoroughly cleaned. In my opinion, the small fans on these units are simply to throw oxides into the air. The quick OH reactions within the units are nice but due to their very short life and limited air movement don’t do much. It’s the peroxides and overall turbulence of the air in the room that matters. 3. The Bi-Polar ionizer is to help get dust particles to stick together so they fall to the ground. The ions can also zap some toxins. I’ve never read of ionizers producing ozone. On the other hand, UV lamps definitely produce ozone and this depends mostly on the type of glass and the special coating (doping) on the inside of the lamp. For example, GPH lamps are standard quartz lamps available in both “ozone-free” (G, GPH lamps) and ozone-generating (G...VH, GPH...VH – VH stands for Very High ozone) versions. 4. Regarding studies, there was a preliminary study with 48 homes of folks with CIRS. MCS and CIRS folks are a sensitive group. The Air Oasis cleaned up their inadequately mold remediated homes to the point that they could live in them again. Having said this, titanium dioxide is the standard for PCO technology. I spoke to AirOasis - they say their specific PCO catalyst produces hydro peroxides (HO2) and hydrogen peroxide (H2O2) which regular PCO does not produce in any significant amount. (Not sure if they have studies to back that up). They said they use ozone producing bulbs which the others don’t do. It sounded like if someone requests a no ozone version they are changing the bulb. They claim the ozone is important in what makes the peroxides. Not all UV lights produce ozone, as you mentioned there are non ozone producing bulbs and that is what Airocide, Vornado, HiTech and others are using. Airocide has a study showing no ozone production, you can see the HiTech bulb used. Talking to the companies is not the best way to get accurate information though I wanted to get Air Oasis' response to this. My intention was not to anaylze the technology of the any of these units because this would take very specialised expertise in chemistry or engineering. All I can say conclusively about Air Oasis is that it moves very little and and it produces more ozone than is considered safe in California. I can also conclude that the other units do not produce ozone. Well, this is turning out to be an interesting conversation. I think you’re right about PCO technology that uses titanium dioxide (Tio2). More credible sources say TiO2 produces mostly Hydroxyl Radicals (OH) along with some Superoxide (oxygen with an extra electron). I’d initially thought all PCO technology produced basically the same oxidants. As you’ve noted, hydroxyl radicals and superoxide react really quickly – fraction of a second for OH and maybe one second for superoxide. So the production of hydrogen peroxide (H2O2) by Air Oasis appears to be a unique result of the 5 different metals they use (silver, nickel, rhodium, copper, and titanium). As noted, H2O2 lasts many hours and ozone has a half-life of 30 minutes. Maybe it’s the longer life of these two oxidants that makes it possible for the Air Oasis to clean up moldy homes that were inadequately remediated. So it turns out that knowing exactly what these machines are producing matters. If you have a Vornado using TiO2 that’s only producing very short lived oxidants, then you need a decent sized fan and good turbulence in the room as the only air that gets cleaned is the air that actually passes through the machine. If you’re using an Air Oasis, then fan size doesn’t matter because the oxidants produced will waft around in the room for some time until they hit upon a particle they can react with. With either machine, getting good air turbulence in the room is essential. As you’re stated and I agree, I don’t think it makes good sense to run an Air Oasis in unoccupied rooms. Depending upon the amount of turbulence along with other factors like the amount of furniture and carpeting in the room, the levels of oxidants that build up may very well be harmful. Having said this, I really do think there is way too much concern over ozone. If I’m living in a building that is literally killing me due to high levels of biotoxins, I think running a machine that can knock out these crushing toxins makes good sense even if it does produce a little ozone. Besides, I can always put the machine in an unoccupied room and if I’m really concerned, I can use a timer and have the machine turn off an hour or so before I enter. Regarding the Bi-Polar ionizer that is also inside the Air Oasis, I stand corrected regarding ozone production. Apparently whenever there is an electrical discharge, ozone is produced. For examples, hair dryers, copy machines, and electrostatic air cleaners also produce ozone. That being said, WikiPedia says the amount of ozone produced is small and given the size of the Bi-Polar unit, I think it’s a stretch to think that a person needs to be concerned about the amount of ozone that unit produces. If that’s the case, then one should really steer clear of waterfalls too as they produce a fair amount of ozone. It’s always a question of degree and weighing risks versus benefits. On the other hand, I have tinkered a bit with UV lamps and I can assure you that depending on the wavelength, glass, and coating, they can produce a lot of ozone. And I mean a lot! As you noted, Air Oasis will fit their machines with a non-ozone lamp if requested. So the meaningful level of ozone coming from the Air Oasis is coming from the lamp. As a point of reference, if I run my G3 3000 Air Oasis in the basement with little furniture and concrete floors, I can pick up the faint smell of ozone after several hours. If I run it on the main level with more furniture, I don’t smell any ozone. Does the level of ozone get above the 0.05ppm in federal guidelines, I don’t know. What I do know is that I don’t need to tax my body any more than it already has been so I generally don’t sit in the area of the house where the machine is running. Initially, my main points were that getting good air turbulence is way more important than fan size, that the ozone coming from an Air Oasis isn’t due to the ionizer, and that I’d personally chose to use a machine with at least a rudimentary study showing that it actually helps clean the air in real world situations – even if it does produce a little ozone. As you stated, anyone can “talk a good game”; what matters is if the machine actually makes a meaningful difference. Along the way, I’ve learned that not all PCO machines produce the same oxidants and that this matters at least in terms of fan size and that ionizers do produce a nominal amount of ozone. Thanks for this discussion Corinne. The effort and care you take in your writings is a testament to your concern for the well being of others and big heart. Greg (and Corinne) - excellent commentary. I bought an Air Oasis Mobile before going to possibly a 3000G3 model. I noticed there was some concern about the 3000G3 not meeting CARB ozone standards (which I believe are <0.05 ppm). I have seen that this is not true and perhaps the conversation mixed up the "regular" 3000G3 with the "extreme" 3000XG3 - the latter does not meet CARB standards and is for 'unoccupied' commercial spaces according to Air Oasis. The 3000G3 is for heavy duty residential use and produces less than 0.05 ppm per their specs and is okay in California. At least this is my understanding and would defer to anyone who knows more about these units. I have been led to the Air Oasis having journeyed long through a Lyme and mold ordeal and researching was to help with my condition. The worst began in 2010 but I have had issues all my life (I am 58 yo in 4 days) - just did not identify the culprits until then. The latest part of this journey for me seems to be extreme mold exposure. I had some in my house and a ton at my work. I work for NASA in an old building constructed just after WWII. Mold was discovered there in a significant way and it explains a lot of my confusing neurological symptoms over the past several years. So, I have been on a mission to eradicate as much of the mold and other biotoxins that I can at home. Removing carpeting, adding dehumidifier, and changing diet and binders and such. In this process, I bought two Honeywell HEPA purifier units and they work rather well and are fairly inexpensive to PURCHASE. However, they consume a LOT of power anfd make a lot of noise so I am feeling I am spending more than I should for this and, more importantly, not being a good "green" steward of the environment. The Air Oasis 3000 G3 uses only 15W of power (compared to 103/163/202W for L/M/H settings on the Honeywell) PLUS it seems that the Air Oasis claims to get more of the contaminants out of the air. I did like the discussion on air flow and Corrine made a lot of sense in that logically, it would seem that decreased air flow would equal less effective results. I don't think this is the case considering the technology used and Greg hit on some of that - the way I understand it is the CFM of these units may be sized appropriately for the different technolgies they are using. Is this a fair statement? I will also use either the Honeywell and/or AO units for my office at work once mold remediation completes in the old building where I worked. Anyway, I appreciate the commentary here so far and would also appreciate any other words of wisdom on the Air Oasis 3000G3 model before I purchase. Thx! Here is the list of models that meet CARB https://www.arb.ca.gov/research/indoor/aircleaners/certified.htm most of Air Oasis models do not meet this as tested by CARB despite the claims they make that they are safe and below certain levels. But yes if you are using this as an ozone machine/ionizer then the CFM becomes less relevant. If you ask them to omit the ozone component this changes what the machine does and I don't think there is much use in it without it compared to the other PCO brands. Hi Biotoxin Journey - In one of Corrine's comments, she said that the Air Oasis representatives said that if you choose to get an Air Oasis without the ozone, then it wouldn't produce the same peroxides. (And therefore it would probably be less effective)... and in one of your comments, you said that it is the combination of the different metals that is producing the peroxides, not the ozone. Which is true? If I were to get an Air Oasis, I would choose to do it without the ozone. Despite the conversation here that it is not the most harmful thing in the world, I really don't need to tax my body any further. I am trying to decide between trying the Air Oasis and the Vornado. P.S. do you work for Air Oasis? I know there is a warranty regarding parts, etc. But if you try it and it just doesn't work for you, is there a money-back guarantee? Thanks! I definitely don’t work for or have any financial ties to Air Oasis. I just think it’s a good machine based upon my research. You can read about my health journey at http://biotoxinjourney.com/. That was an interesting point Corinne brought up about the Air Oasis not producing peroxides without using an ozone generating UV lamp. Apparently, the combination of ozone, UV, and multi-metal catalyst are required to get the full benefit of the machine. In other words, PCO technology in general involves shining UV light on a metal “catalyst” and from what Corinne has learned, we also need ozone for the production of peroxides in the Air Oasis. Anyway, I totally understand if some folks just don’t want to expose themselves to any level of ozone. While I’m somewhat sensitive to chemicals, I certainly don’t have anywhere near the reactions some with MCS have. I just thought I could round out this topic with some of the material I’d learned in studying about the Air Oasis. Regardless of what machine you use, I’d definitely run a room fan to help get the Air Oasis peroxides out into the room or move un-cleaned air to the base of the Vornado. I got my Air Oasis from https://inspiredliving.com and they do have a 30-day return policy. Thanks for your reply. I wasn't concerned about you having any financial ties to Air Oasis, I was more interested if you know about their guarantee. I will check out the site you mentioned and call them too. Aside from the ozone concerns, I am interested to see if the claims that many people make about Air Oasis could be true for me as it seems that it has helped so many people. I'm particularly interested in the travel model they make now which would be amazing if it helped with visiting other people's moldy homes or being able to work. I may give both the Air Oasis and the Vornado a try since both seem to have a way to try them out and return if they're not helping. Thanks ! Hydroxyl definitely will not search and destroy. They are highly reactive and will burn up within a fraction of a second. Also, I can’t say for sure what’s produced without ozone in the Air Oasis. I’m assuming from what I know about PCO in general and what Corinne found out that without ozone the bulk of the oxidants are hydroxyls. It’s sort of a moot point though because if you’re not going to use ozone, I’d personally go with the Vorando. Just based upon its size, I’m guessing it produces more hydroxyls than the Air Oasis without ozone. Besides, it’s got HEPA and carbon. Regarding the portable Air Oasis unit, I have one for when I travel. Recently, I was down South and unfortunately picked a moldy hotel. I’d had a long day and it was really late to change hotels. I thought I could tough it out. I was wrong. After nodding off for an hour, I woke up with that familiar feeling of high excitability in my body. Ugh. I was running the small portable unit but there was no way it was going to keep up with what was pouring out of the A/C. Desperate, I took the sheet of plastic I always bring with me and laid it on the bathroom floor. I normally use this plastic under the mattress cover. On top of the plastic, I laid down a heavy blanket. I closed the door and fired up my portable unit. It was enough. The fight-or-flight reaction calmed down considerably and I was able to get some sleep – albeit a bit rough. These machines definitely have their limitations. Well, that’s it for me on this topic. I'm bowing out. Thank you so much. I appreciate your help and clarifications! What about the Air Oasis N Duct that goes right into the air handler? I'm MCS from pesticide exposure and they are indoors lingering, low ppms but the toxins are intolerable. Nobody ever mentions the ozone from the a/c company. They say it's just hydrogen peroxide. I have thirty days and then have to pay trip charge even tho it's nearby, labor to remove and restocking fee. So, I got hosed if I can't tolerate it. I'm still not fully back in my home. I'm still testing. What about the ones that are INSTALLED? My doctor recommended an actual ozone generator which I think would be even worse for me. Once someone is pesticided, they don't trust much but I can't live with pesticide residue aka nerve gas stuck in my house. I have plenty of ceiling fans to keep the air circulating. Anyone have any opinions or facts? The company never talks about ozone. Only customers do. Any suggestions regarding optimal humidity levels for PCO devices? I keep my house around 45-50% to avoid mold growth, but I'm concerned that the PCO devices (Air Oasis, etc) might need 55-60% for optimal performance. Thoughts? HiTech responded to my article. In the article I ask the company/sales reps to stop making unsubstantiated claims. 1) The machine is not FDA approved (says Ray the owner in the public conference call), but the technology is. My response: Other brands of machines using PCO have FDA approval. That does not mean HiTech does. We do not know what is in Hitech, and on top of that they claim their machine makes a different kind of OH molecule, so I don't see how that would be covered by another machine's FDA approval. Receipts: we have many screen shots of sales reps saying this is FDA approved. 2) There is no patent says Ray in the call. Receipts: we have many screen shots of them saying this is patent pending and I received that info from a sales rep as well. Ray in the call denies some statements I made. He says that Sporax is not sprayed on the filters. He says that that bulbs are not coated with anything. I have screen shots of the sales reps saying these two things. Note how before this they claimed the unit was being used in neonatal units until Sandy Wolfe questioned them repeatedly. In the end the sales rep said it is not used in neonatal units. Plenty of screen shots to show this. They claimed a study was done by Texas Tech, now we see the reps saying it wasn't a study, and Ray says in the call it was just "a doctor from a university", but not a study. A number of unsubstantiated claims were made in the conference call about many tests being done with this machine. I have not seen any evidence of these tests. Unfortunately, I don't think the blog post can stay updated enough to keep up with the statements this company makes, but I will add this info in the comments or in a footnote. A courthouse in Mississippi eradicating mould on a wall 40 foot away with HiTech. Where is any proof that this machine can eradicate visible mould on a wall? A lab tested places for mycotoxins after HiTech used. Which mycotoxin lab? Let's see the tests. Tests were done to compare HiTech to other PCO machines. Where are any of these tests? Ray says: he spent $350,000 to find out why a mould sensitive person would react to the machine. Where is the test on this, or any proof of this? Ray claims burning smell is mould being eradicated. He says "That’s a fact". Facts need proof, where is the proof of that? I have low end VOC remover/purifiers by ORECK. Believe it or not, when it is pulling VOCs out of the air, these purifiers emit a smudgepot odor and that means it's working. When it grabs significant amount of particulates at one time, that smell means it's working - it caught a bunch of particulates at once. I believe it's working but I'm afraid of ozone but more afraid of lingering outdoor pesticides that got into my home. I'm not sure what the ORECK is, red flags there in obscuring what technology they are using. From the website it's not clear. I purchased the Vornado PCO 500 (currently available on Amazon for $399) and after a couple of days of trial am feeling like it is making a difference for me. The issue that I am dealing with at present is outdoor mold (e.g. Fusarium) growing in the wake of Roundup usage in corn/soy fields here in the Midwest, and exacerbated by all the rain that we have been having. I have felt like inexpensive HEPA machines have been somewhat helpful for that, but this larger machine has made a much bigger difference (in a 2BR townhouse with cathedral ceilings and ceiling fans). Whether the improvements are due just to the HEPA or also to the PCO, I'm not sure. I continue to doubt whether this machine would make any difference at all for supertoxins (such as the sewer toxin that I have been referring to as "Mystery Toxin"), and I doubt that it would do much for a mold growth problem in a building (unless it were something really minor). But for this purpose, I do think it is making a noticeable difference so far. That's great Lisa! I'm glad it is helping. I would definitely agree with not using it in a place with a known mould problem or leak. I'm not committed to this brand, I'm finding it a bit offgassy. I'm hearing more from others though that they do well with this technology. The GermGuardian is one I am hearing about. Molekule is one that I think is more promising than I initially thought. I will update this post with those comments. Does anybody know re the EMF of these different air purifiers, for the very EMF sensitive? Thanks. Good question; I'm interested in knowing too. All of this information has been extremely useful; so I'm very glad for the article and everyone's comments. I have decided to go with the Molekule and have ordered two units. This will be enough for my first floor since each unit covers 600 square feet with one ACH. I'll share my experience. Thanks again. Awesome! Would love to hear what you think about it. Hi Lemonlark, Just wondering how you like the Molekule. Thanks. Hi Corinne, Thank you for all your research. I am looking into buying the Vornado and possibly the Molecule. Since Vornado uses the PCO technology, do you have any information how much this machine producing formaldehyde as a by product? Is it anything of a concern? Thanks very much. Hi Anja, You can look through the studies on that. Some show formaldehyde and others not. That is why I would hesitate to use it in a high VOC area but you can also just see if you feel better or worse. http://www.bridair.com , this company looks to have developed an interesting PCO system. No need to ever change/buy a filter! Corinne -- any info or reviews on this one? A quick glance here and not seeing Austin HEPA filters mentioned. Anyone have an opinion? Our highly-allergic extended family has used them for 5 years in two houses and been impressed with them. However, we are now faced with a severe roof leak and hidden mold infestation in our living room wall and need additional air purifiers while waiting for the remediation team. Has anyone else been happy with the Austin brand? Hi there, I have read your blog off and on when I have been in need of suggestions for renovations or products. thank you for sharing! I just recently heard about a program that can possibly heal our brain which might be causing an overreaction to chemicals and other chronic conditions. I have been struggling for years with chemical sensitivities and food sensitivities and light and sound sensitivities... so I am so ready to heal. I just thought I would send you this link in case it might help others! again thank you for your sharing on this site! Any advice on the best air purifier for a newly built home? It has a conditioned attic so no air flow up there. Lots of windows we can open but I’m very concerned about initial off gassing. Thinking about getting the IQ air that’s installed in the A/C unit. Although I think I am a bit over my head in understanding fully everything here I am extremely grateful for this information and the sharing of it here. Thank you!!!! I don't know what machine to get, all I know is I'm pregnant we live in a lake home in the far northern Midwest (near Canada) and we have had mold issues (bathroom and also furnace area there was a leak that went unnoticed for some time). We also have huge dust issues due to an old carpet the home owner is finally allowing us to get rid of (has taken years to achieve this). Anyways I'm having a home birth and I am afraid of the mold, dust and any other pollutants being an issue for the baby. Could you please help me choose a machine? I'm thinking of getting the molekule but we really can't afford it. Any advice will be a blessing! Do you have any information about the EnviroKlenz Mobile Air System with UV Light? Says it takes care of mold spores and toxins that are emitted from mold as well as chemicals and odors. https://enviroklenz.com/product/enviroklenz-mobile-uv-model/. Would like to know if it is 3rd party tested. Purchased it on recommendation of Wendy Myer a health consultant who helps balance minerals and detox heavy metals. Any recommendations on this one. Did you ask how long the Hydroxyl free radicals last in the air for each of these devices? I'm discovering that it can be quite different, depending on the PCO technology, so while they are all similar in that they are PCO devices (with the exception of the Molekule being a PECO) their reactor pad material can vary quite a bit. IQAir has come out with a PCO device that supposedly covers a large square footage by comparison to other units, but I'm not sure I am in love with the technology and they haven't answered me back in terms of how long the Hydroxyls remain airborne and active. You can increase the fan capacity and that's where they're getting the square footage from, you can increase the surface area of the titanium dioxide and the amount of UV lights, but to my knowledge you cannot increase the amount of time that the hydroxyls are active. Hi techs claims have absolutely no basis. Love learning from these posts! We had a bad case of mold in the shower wall, so I bought several purifiers after the remediation. We have 2 IQ Airs (one in family room and one in our bedroom), one Austin Air in another bedroom, a Germ Guardian in another bedroom, a Therapure with UV (photocatalytic), a Germ Guardian in the kitchen, a Holmes in the laundry room, and another Holmes in the entry way. We also had a special photocatalytic hospital grade filter with UV bulb put in on our new Central Heat and Air system. Are these too much? Will some interfere with others? I have not been feeling great and have developed some MCS. Could some of these be causing an issue? What about our filter on our system? It is the filter sold by Gilmore Heating and Air. Thanks so much for your help!!! Has anyone here discussed, used or reasesrched the Airfree brand as they claim it has the most independent tests done on it than any other air purifier. Allergycosmos done a short review on it and isn’t confident about how truly independent they really are so I’m confused and would love others thoughts. Airfree.com is the site thanks. I was poisoned by mold, and may be one of those people who cannot get mold and other mycotoxins out of my body. I'm still on the journey of figuring it all out. Been battling mold illness since 2007, but became aware that it was mold in 2009. It's an incredibly isolating and challenging road. In summer, 2017, I bought a "Beyond Guardian Air" by Aerus and a "Guardian Angel" also by Aerus. 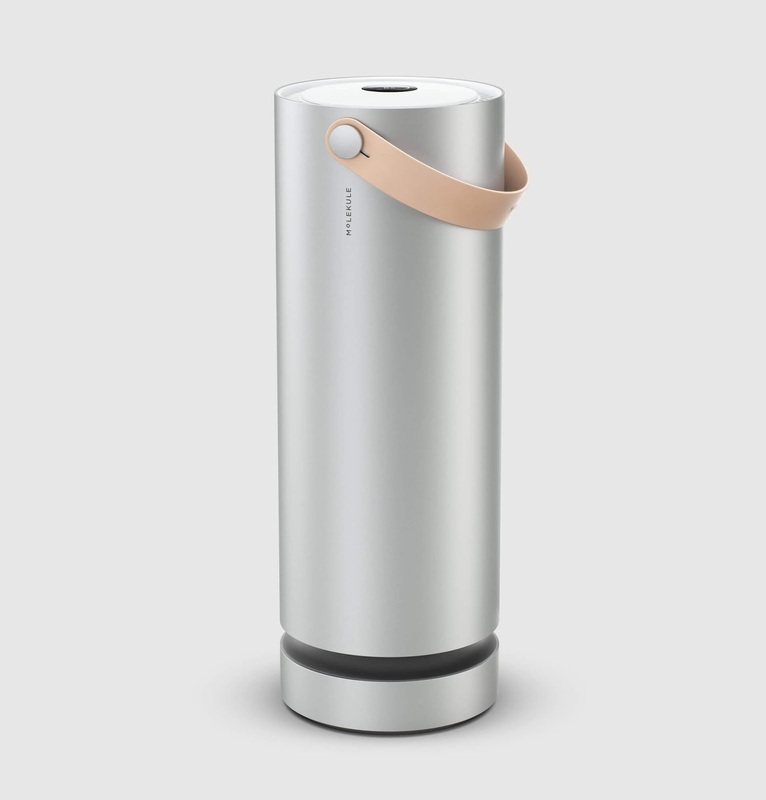 Any experts out there familiar with these air purifiers? They are high-end. The Beyond model uses Active Pure (space) technology and supposedly is used by NASA. http://www.beyondbyaerus.com/Site/ I'm looking for better ways to get back a decent quality-of-life and would also like to connect with others and a community of people who understand. Hi Donna, to connect with others try the Facebook groups on mold. There are quite a few. Donna, I have the Guardian Angel - a friend gave it to me. Did you get one? I mentioned being in mold last year and...BOOM! Hi Tech Sales Reps were instant messsging me with obvious sales tactics like saying there is a secret or magic ingredient that makes it work. I was desperate so I bought one. I put so much money and energy into getting that thing to work - to no avail. Now, I believe I was in an old building with moderate inner wall mold and the bathroom didn’t smell good but looked good...I don’t believe there was an active leak but I can’t be sure. Anyway, I got so sick in that place trusting the Hi Tech which for me was too much O2 output. Ray the owner is a nice man, but half of me believes he has convinced himself that the product works, and the other half of me thinks he knows it doesn’t workd but is selling it anyway. I am out over $1000, got extremely and seriously ill thinking it was helping me, u til my stomach began to inflate with fluid which is still housing toxins to keep them away from my vital organs. I got very large thyroid nodes and other organ issues. Ray becomes incredibly defensive about his product, and I had a very gold question which he could NEVER produce a real answer to, which was that I had read all over the internet that O2 Radicals destroy DNA. I was also kicked off the Hi Tech Users FB group while owning the machine because I asked direct questions, and wouldn’t allow the sales reps and their “friends” who wanted to believe for that period of time the machine was working, but who were still really sick, and weee defending the product along with the reps, as I stuck to my point through all of their manipulation and misleading. I kept asking the same question about this DNA issue because I care about myself. No one ever gave me a straight answer, and I was ousted from the group. Of course during this, the owner Ray suddenly showed up to help his reps defend - a rare occurrence - and acted like an 11-year-old, becoming defensive and so forth...it truly was like kindergarten. I am unhappy that being on Section 8 with only a credit card and nowhere to go, that I was treated like that AND the product didn’t work. But I know that I was good bait. And I took it...hook, line and sinker. Oh - he will send you a Cease & Desist, too - for saying negative things about the product of he feels it’s untrue or the like. Wouldn’t any good product not worry that much about word if mouth? I've got MCS, Lyme, and a house that is slowly becoming more moldly and am trying to find a particularly good air purifier. A company called "Innovative Labs LLC" appears to have designed one (Senoma Breeze) which I'm having trouble locating. I'm guessing they will be pricey. Anyone have knowledge of or experience with this company or type of purification? Any comment on the Air Oasis Mobile unit? Have you ever used or reviewed Allerair? I just bought a house and it badly needs remediation. Your information and insights are invaluable. Thank you! In regard to Allerair: I have owned what is now currently marketed as the Airmedic Pro 5 Plus Vocarb for about 6 years. It does filter out the VOCs that adsorb to carbon (there are many chemicals that won't), but due to unevenness in the sheet metal of the body, a lot of air passes directly through to the exhaust port bypassing the filter thus leading to a large amount of fine particle buildup on the exhaust port over time. This and the fact that dealing with customer service from this company is not pleasant, I would look at a different company (I had considered Austin Air). Also I had to replace the pre-filter that came with it with a better 3rd party merv8 polyester filter, as the original allowed the carbon filter to get clogged with dust. Additionally, while the carbon based units do filter a decent range of VOC's, there is something being released from newly installed polypropylene carpet backing that it can't remove, so I just ordered the PCO based Vornado to see if that will work. I am very intrigued with the technology of airfree.com. This was recommended to me by wondermakers.com, highly experienced in mold remediation. I too, would like to know if anybody has tried one of these. They will not eliminate formaldehyde according to their sales force but I like the science and development in Europe who seem to take enviromental things much deeper. Do you have any experience with any of the air purifiers from E.L. Foust? It's a really good one if you are looking for help with offgassing and particulates.